1. 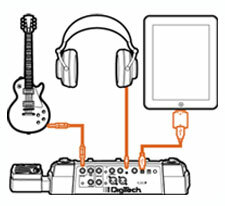 Connect your DigiTech multi-effect pedal to your iPad with a USB cable and USB host adapter, like the Apple Camera Kit. The LED display will read "USB IN" when connected successfully. 2. Connect your guitar to the input and headphones into the headphones jack on the pedal. 3. Launch your favorite recording app in your iPad. NOTE: You can adjust the USB Recording and USB Playback levels on your pedal to your preferred level, refer to the owners manual. LOOPER 20 Sec. 20 Sec. 20 Sec. 20 Sec. 20 Sec. 20 Sec. All USB equipped RP and BP multi-effects pedals are compatible with the iPad. There are six different models with direct streaming and playback capability over the USB connection. They include the RP155, RP255, RP355, BP355, RP500, and RP1000. DigiTech pedals stream 24-bit audio at 44.1 kHz sample rate to an iPad over the USB connection. This ensures the highest quality audio for recording and playback. When you use DigiTech processors to stream music over USB you don't experience pops and feedback like those experienced when using other devices to stream an instrument through the headphone jack. It's easy to do: Simply connect your RP to your iPad with a USB cable and USB host adaptor. Plug in your guitar and launch your favorite music app to begin streaming. You can record, playback and share your tracks easier than ever. By using the processing power of DigiTech's multi-effect pedals, you free-up more processing power in the iPad making it easier to get the results you want. Customers can connect any USB equipped DigiTech multi-effect pedal to an iPad using a USB cable and USB host adapter like the iPad Camera Kit. Adapters are available at many of Apple's authorized iPad dealers and online at apple.com.